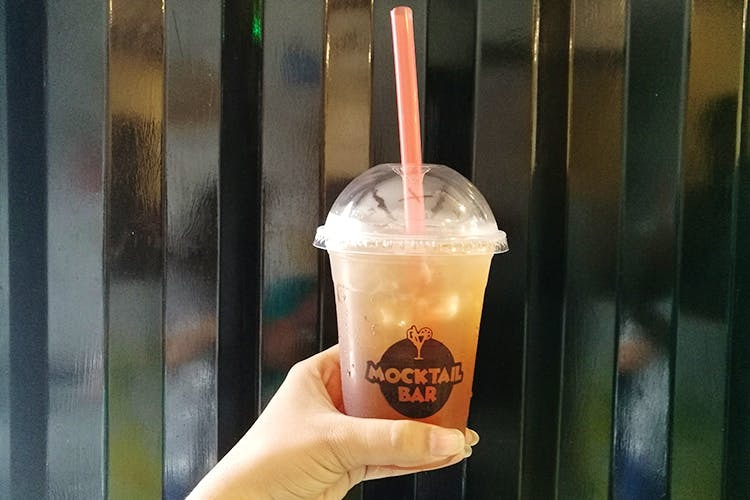 Grab a glass of mocktail to sip on the go, or chill with BFF at the Mocktail Bar in Madhapur. Mocktail Bar is a tiny shop on the main road, that opened barely 4 days ago. With enough place to sit for just you and a friend, this is mainly a takeaway joint for ice-teas and bubble teas, after a fine luncheon. They have flavours like bubblegum, green apple, lavender, peach, cucumber, and citrus for ice-tea lovers. The lavender ice tea had a distinct taste that feels much like a floral scent (Not that we've tasted a perfume), and the bubblegum flavour will make you nostalgic with the familiar taste of Boomer. We also found boba pearls in kiwi, passion fruit, litchi, strawberry and mango flavours. However, they haven't started serving bubble tea just yet. We hear that the place will also be dishing out snacks like sandwiches and Maggi soon, but for now, we're totally digging the ice tea. We think that the staff was friendly, but not experienced enough. And, the place can get a little too congested if you're a group of three or more.